Fifty years ago, on August 5, 1966, Bian Zhongyun (卞仲耘), the head of a Beijing girls’ school, died after being beaten and mishandled by Red Guards, in an incident that marked the beginning of “Red August.” Within a month, more than a thousand people were killed in Beijing, triggering a tide of violence that swept the whole country. Despite heated debates, the exact circumstances of Bian’s death remain contentious and shrouded in secrecy, no doubt compounded by the fact that at the time the daughters of several top state leaders attended the school. Song Binbin (宋彬彬), the head of a Red Guard group in the school and daughter of a PLA general, offered a vaguely worded apology in early 2014 that was challenged by Bian’s widower, Wang Jingyao (王晶垚), now aged 95. Exchanges of letters, interviews, and witness accounts ensued, on the internet, social media, and in some unofficial publications that circulate by email. Previously, an independent documentary had been made (Hu Jie’s Though I Am Gone, 2006), in which a janitor (a former teacher who had been demoted) offered an eyewitness account. But in the absence of key witnesses and official approval to discuss the events, there is no definite way of attributing responsibility. This case highlights the incipient public sphere that emerged in China in the last decade to debate historical issues, the constraints it must deal with, and the increasing difficulties it has faced over the last year or two. In July, the shutdown, after an administrative reshuffle, of a prominent journal devoted to debating history, Annals of the Yellow Emperor, highlighted these growing restrictions. No publication has been more instrumental during the last decade in opening the sphere of discussions about the Mao era than Annals of the Yellow Emperor, a monthly journal backed by retired inner-Party reformers, with over 200,000 subscribers. Annals published an occasional column titled “Confessions,” dedicated to remorseful accounts of former persecutors. The journal had experienced growing tensions with censors and had to change its registration from a private company to a state administration in 2014; at the same time, one of the editors, Yang Jisheng, came under increased pressure for his book Tombstone, devoted to the great famine of 1959-1961. 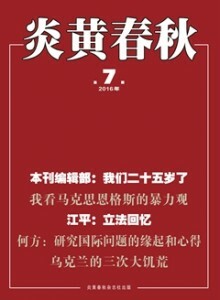 After a reported standoff over how many articles commemorating the Cultural Revolution to include in the May issue, the journal was effectively shut down in early July, as a new editor was appointed from outside. In the end, the May issue had kept only one article on the Cultural Revolution by one of China’s most prominent and uncontested specialists, Jin Dalu, a professor at the Shanghai Academy of Social Sciences. In it, Jin called for the “de-ideologizing” of Cultural Revolution research and the return of academic standards; he denounced the instrumentalizing of research as a form of revenge and emphasized the need to arrive at some kind of social consensus about the Cultural Revolution. He also noted the need to foster strong research within China, or risk loosing academic credibility and an authoritative voice to discuss the Cultural Revolution with historians worldwide. Over the first half of 2016, Annals had published several other articles by prominent contributors, setting the tone for the debate. In the March issue, an excerpt from a new book by former minister of culture Wang Meng pointed out that considering the Cultural Revolution as an expression of Mao’s wish to democratize society was a terrible misunderstanding. Wang concluded by describing the need to research and reflect on the Cultural Revolution as China’s and the Party’s responsibility to the world. In July, Zhou Ruijin, a former deputy editor of People’s Daily who was also affiliated with Annals, published a long essay on I-feng Opinion, a website associated with Hong Kong-based Phoenix TV, arguing that the Cultural Revolution demonstrated the need for a more open, more democratic political system based on the rule of law. Historians have also figured prominently in the discussion. In the March issue of Annals, Shanghai-based Wang Haiguang called for ethical reflection, but also for a new direction in historical research on the Cultural Revolution, turning toward society, the periphery, and everyday history, away from elites, the center, and the state, as well as toward academic research and away from politics. The decision to bring Annals under the direct control of the state was probably connected to its perennial testing of the borders of permissible topics, rather than to any one article. It does, however, highlight the fact that deep-reaching discussions of the Cultural Revolution are both widespread and, from the perspective of the state, unwelcome. Similarly, in 1996, the prominent reformist magazine Orient was shut down over a special issue commemorating the thirtieth anniversary of the Cultural Revolution. But the closure of Annals also underscores a deeper paradox of Chinese society. It can be argued that the collective memory of the Cultural Revolution is currently undergoing a third stage. In the 1980s, trauma dominated among the victims of violence, and traumatic, oftentimes irrational, memories were expressed mainly in literature, in which avant-garde forms could be used as a foil for the rational analysis of events. The events were “negated”—that is, repressed—rather than discussed. In the 1990s, as China underwent large-scale marketization, Mao nostalgia was revived by victims of economic reforms, who used portraits of Mao and references to the collective era to pressure the state through a series of contentious movements. Over the last ten years, these earlier currents have given way to the expression of everyday, often critical, memories from all walks of society, expressed in journals, self-published memoirs, independent documentary films, private museums, or online discussion groups. These very diverse expressions of memory have, to an extent, been tolerated. As anthropologists of memory like Rubie Watson have argued, governments always try to “privatize” problematic or challenging memories while individuals try to “publicize” them. Hence, as long as these memories were “private,” they were not actively suppressed. However, what Annals offered to its readers, was an embryonic public space, in which different memories could contribute to substantive, critical discussion. Individual memories can be erroneous, biased, or tainted by forgetfulness and cognitive selection, or, of course, influenced by external pressure, as debates about Bian Zhongyun’s death or Yang Jiang’s responsibility illustrate. But a public sphere for discussion of individual memories, in which historians and witnesses can interact within a common framework of reference, is liable to engage more substantively with the most difficult and contentious issues still raised by the Cultural Revolution. This was Annals’ main contribution, and no doubt the reason why it could not fulfill the task that its editors had set for themselves. The author would like to thank the Robert Bosch Foundation for organizing a panel discussion that provided the initial impetus for the present piece.